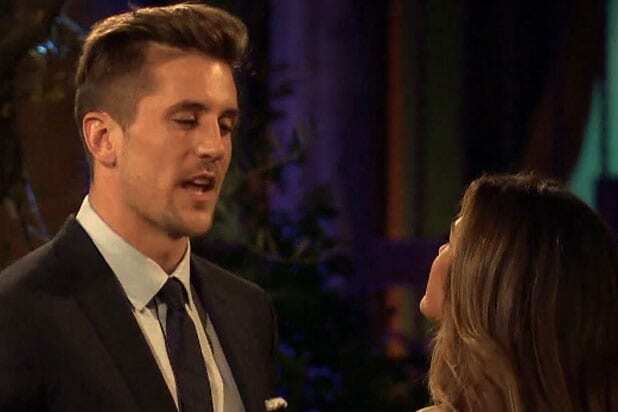 “The Bachelorette” JoJo Fletcher admitted she knew who contestant Jordan Rodgers was, and that he’s the younger brother of Green Bay Packers quarterback Aaron Rodgers, before he stepped out of the limo on Monday night. “A week before this whole thing started I think his name got leaked, and it was kind of all over the Internet, so, you know, it’s like ‘Jordan Rodgers, brother of Aaron’ — so that’s what I knew going into it,” she told Entertainment Tonight‘s Nancy O’Dell. However, the 25-year-old reality star insisted that she didn’t know much about him and that her knowledge of Rodgers didn’t influence her at all throughout the season. Fletcher denied having known Rodgers before the ABC show premiered. However, Fletcher and Rodgers, 27, hit it off right away during Monday’s premiere of the 20th season. Fletcher gave him both the first proper kiss of the night — after being forced into an awkward kiss with Will — and the First Impression Rose. Already, there has been a lot of controversy regarding Rodgers’ partaking in the show. In the teaser for the upcoming season, the other men in the house attack the retired NFL player. And shortly after the premiere, a woman claiming to be Rodgers’ ex accused him of cheating and wanting fame. “Riding the bench doesn’t get in the way of a relationship, but cheating does. #yourpitchisntperfect @jrodgers11 #alwayswantedtobefamous #dreamscometrue #tuneinnextweekformoreBS,” Brittany Farrar posted on Instagram. After being the starting quarterback at Vanderbilt University, Rodgers followed the career path of his Super Bowl champion big brother, playing for the Tampa Bay Buccaneers and the Miami Dolphins, but only experienced a fraction of his success and never saw action in an NFL regular-season game. While Rodgers seems to be the clear frontrunner of the season so far, Fletcher would not reveal whether she was able to find love this season. “You’ll have to tune in to see!” she said. Joelle "JoJo" Fletcher began her journey for love on Monday. While JoJo was meeting all the men for the first time, one suitor stepped out of the limo wearing a kilt and told her he was half Chinese, half Scottish, but thankfully, “Scottish below the waist.” JoJo winced and responded, "What does that mean?" He was just cringeworthy-full stop. From starting with a misplaced "Damn, Daniel" joke and accusing JoJo of being out of the loop, to stripping and poking people in the belly button, he definitely is one of the stranger men in the house. Oh, and his occupation is "Canadian," too. This was painfully awkward to watch. Will attempted to seduce JoJo with a 4th grade-type fortune teller and forced her into an awkward peck that JoJo prefaced with, "Are you ready?" Santa came early this year, and brought a gift for the Bachelorette, as well. Although he scored a perfect 10 on the creepiness scale, he still managed to get a rose from JoJo. While JoJo was filming her one-on-one interview, not one but two clearly intoxicated contestants interrupted filming, and didn't realize she was mid-interview. A "Bachelorette" episode wouldn't be good without an old flame or old contestant busting in. And that's exactly what happened on Season 12's premiere -- former "Bachelor" Jake Pavelka came in during the rose ceremony, giving the other men anxiety. In the end, he just wanted to give JoJo some good advice, but their entire interaction was extremely awkward and forced. Aaron Rodgers' brother, Jordan, is a clear frontrunner for JoJo, but a teaser for the upcoming season reveals that the other contestants aren't too happy with the retired NFL player. After the premiere, a woman claiming to be Rodgers' ex-girlfriend accused him of cheating on Instagram. Jordan should be grateful the show isn't filmed live.